Yesterday 9 years ago, on the 15th of May 2004, the then Dutch minister of Transport, Carla Peijs, opened a cycle bridge. Of course a minister doesn’t show up to open just any bridge. This was, and still is, one of the largest cycle bridges in the country*. It takes you over the river Waal in Nijmegen and it has a total length of 2 kilometres (almost 1 1/4 mile) with a main span of 235 metres (771 ft). The bridge was attached to the railway bridge that had already been there since 1879. 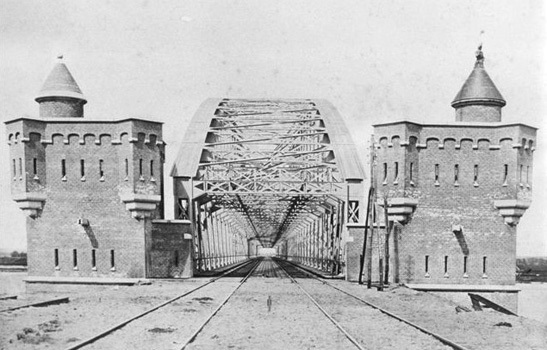 The original rail road bridge in Nijmegen. The steel arches (originally 3, now only 1) were last replaced in 1984. The entrance of the bridge as it is now. Clearly visible is that one of the restaured abutment towers of the bridge had to be opened up to give access to the cycle bridge. I had visited and filmed the bridge before. But that was at a time that I only published videos so I didn’t have the chance to give you background information. I also didn’t have the wide-screen HD camera yet so there were some reasons to visit the bridge again and write a new blog post with a new video. The name of the bridge is ‘Snelbinder’. That word literally means to ‘bind’ (connect) ‘quickly’ but the word is used for the elastic bands you will find on luggage carriers on Dutch bikes with which you can quickly secure your luggage to your bicycle. Of course the more literal meaning was the reason for the name: this bridge is a quick connection to Lent, the new suburb of Nijmegen across the river. The bridge was constructed on the north shore and then shipped to its position. Four very large floating cranes were needed to do that. On 20th March 2004 the river was closed to ships and also the railways were shut down for the day. The bridge was secured that day and then it took several weeks to finish the bridge’s details. The bridge was shipped in position in March 2004. The bridge weighs 750 metric tons and the arch is 26 metres tall. It has cost no less than 40 million euros. But to the people of Nijmegen it was worth every penny. They are very proud of their wide cycle bridge, with its protective wind screens and good lighting. All to enhance the feeling of social safety, also in the night, so everybody can use the bridge to get from the city to the new suburb and back again. In my 2009 video I showed you the escalators that provided a short cut half way up the bridge. They are still there (visible at 01:08 in the video), but they have not been in use for a very long time. Open air escalators proved not such a good idea in the Dutch climate and vandalism didn’t help either. They were out of service a lot of the time and when they were working the neighbourhood residents complained they made too much noise. Even though most of the repairs were covered by the maintenance contract (15,000 euro per year) the number of disturbances had gotten out of hand. In 2009 there were 11 malfunctions and in another year there were even 18 times the escalators didn’t work for longer periods. On top of everything the ‘Liftinstituut“, the safety inspection body in the Netherlands, advises against the use of bicycles on escalators (even though this has been common practice for a long time, as these two examples show you). The Dutch Cyclists’ Union agrees that bicycles on escalators are dangerous. The Nijmegen bridge. Stairs and the (now out of use) escalators give (an extra) access to the cycle bridge. Also clearly visible how the 21st century concrete and steel cycle bridge was attached to the 19th century brick railway bridge. 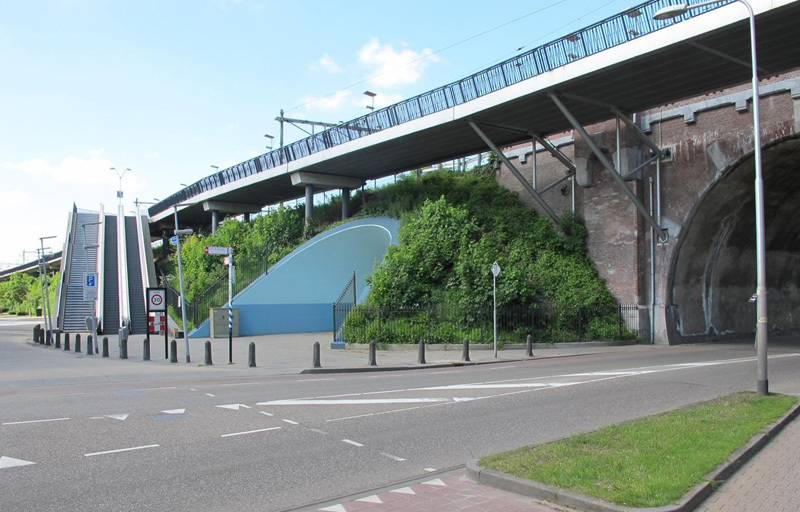 In September 2012 the Nijmegen city council announced their intention to replace the escalators by stairs, suitable to be used with your bicycle. The council would try to come to a good solution with several parties involved, including the local branch of the Cyclists’ Union. They had considered covering the escalators to better shield them from the weather, but feared even more vandalism when the escalators would not be in the open anymore, they also feared they wouldn’t feel so socially safe anymore in that case. The high costs of maintenance played a role too. There were more changes to the bridge. In Summer 2012 the north end had to be changed because a new railway station was built right next to the bridge. The changes to the entrance ramps were so considerable (many bridge parts had to be replaced) that the bridge had to be closed to all traffic for 10 days. The new railway station will be opened late 2013. You can see the reconstruction was still going when I filmed the video (at 04:48). 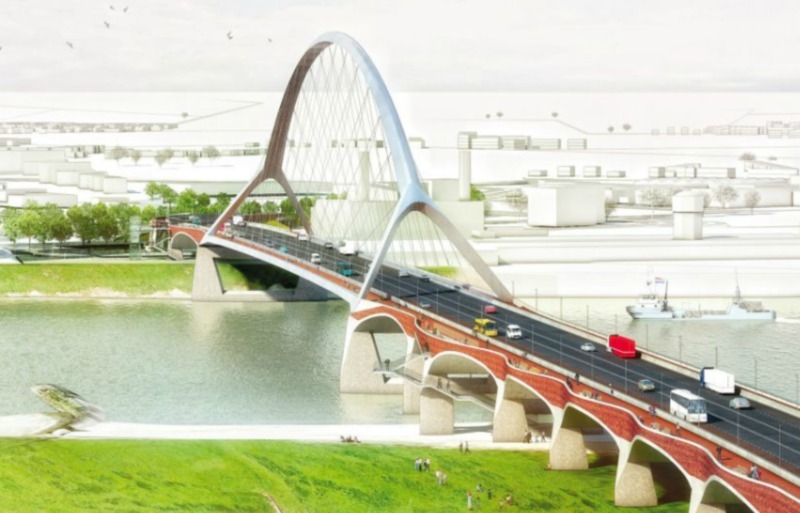 The bridge will eventually connect to and be part of the high-speed cycle route from Nijmegen all the way to Arnhem, called Rijnwaalpad. In the final 40 seconds of the video you can see how close the bridge is to Nijmegen Central Railway Station. These final seconds also show you that the bridge is not an ‘island’. The perfect infrastructure continues all the way to the station even though the cycle path is diverted for road works. After 9 years the bridge is part of the identity of the Nijmegen people. In a survey 9 out of 10 Nijmegians called this project important or even very important for the city. The Nijmegen cycle bridge attached to the rail road bridge. In 2013 the city is building a whole new bridge expected to be finished by the end of the year. It will form the second possibility for motor traffic to cross the river, but the third for people cycling. There is a video with an artist’s impression in which a man can curiously be seen running the cycle path of that new bridge. 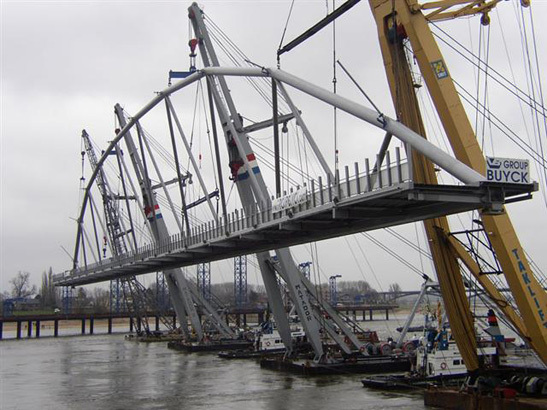 A completely new bridge is currently being built in Nijmegen. It is expected to be finished late 2013. It is a combined motor traffic and cycle traffic bridge. * The Nijmegen cycle/railway bridge actually has a much larger main span than the Amsterdam Nescio bridge and the total length is almost three times as long. But Amsterdam insists they have the biggest cycle bridge, probably because that Amsterdam bridge is purely a cycle bridge and this Nijmegen bridge depends on the structure of the railway bridge that it is attached to. There is an intriguing other coincidental connection between this bridge and Nescio bridge. Nescio was a Dutch writer and in one of his novels someone commits suicide by stepping off the Nijmegen railway bridge. To commemorate this, there is a plaque with a text by Nescio on the Nijmegen cycle bridge. I may be visiting Nijmegen this July. If I do, I will have to cycle over the bridge. I will be one of the many Canadian Army veterans to see the currently serving members of the Canadian Army undertaking the famous Nijmegen March. Rest assured that, at my age, this will be as a spectator only! If I am able to go I will be participating in the ceremony at the Canadian Military Cemetery in nearby Groesbeek where over 2,300 Canadian soldiers are buried who were killed in the liberation of The Netherlands. Kevin if you do manage to get to this important event in July, which I sincerely hope, I’d love to help you in arranging to cycle this bridge too. It would be an honour. I would love to, And I am sure that I will. If not this year, then next year. I was able to visit the Holton Canadian Military Cemetery in 2006, which is the last time that I was able to visit The Netherlands. Great hisorical view on the ‘Snelbinder’, Mark. Thanks! My favorite city in NL. Thanks for the revisit. BTW, I have been following the live feed of the building of the new bridge since day 1. Check it out here. What is a ‘free-lying’ cycle path? Yeah that’s translated Dutch 😉 A cycle path that is not connected to a road for motor traffic. An individual cycle track. Or a ‘road’ just for cycle traffic. A separate route. I don’t think there is a good English word for this phenomenon. Are there bike paths on both sides of the bridge? No, just one bi-directional cycle path on one side, that goes for this bridge and the new one. Most newer cycle paths in NL are bi-directional on one side of roads or free-lying altogether. It’s more of an independent route that way, nothing to do with motor traffic or its routes. This is very interesting. 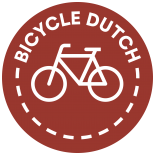 I asked the Dutch delegates about this at our local “Love Cycling, Go Dutch” event in Manchester last year. I think it was Wim van der Wijk who told me that the preferred Dutch model would have one direction of cycle path on each side of the “road” for ease of access (or something?). Possibly he was referring to the specific situation under discussion (Manchester’s Curry Mile). For city roads with numerous intersections, yes, I think van der Wijk’s answer is correct, the Dutch normally have single-direction cycle tracks on both sides. The bi-directional path is more the thing for connecting towns, where there are few crossing roads. 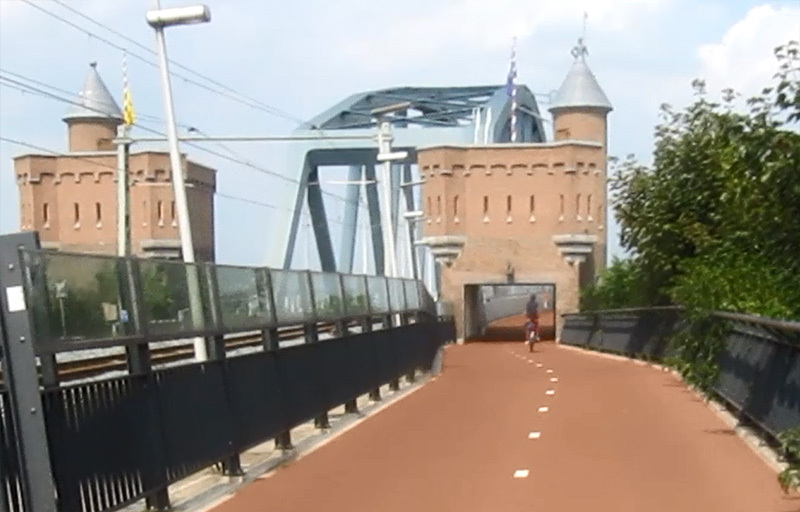 This entry was posted on 16 May 2013 by Bicycle Dutch in Original posts and tagged big bridge, bridge, exceptional cycling infrastructure, Nijmegen.